Waste engineer Jenna Jambeck of the University of Georgia surveys plastic waste in a southeast Asian village, where it will be recycled to make raw material for more plastic products. Jambeck advises Asian governments on how to keep plastic trash out of waterways. The single largest use for plastic is packaging, Jambeck says. 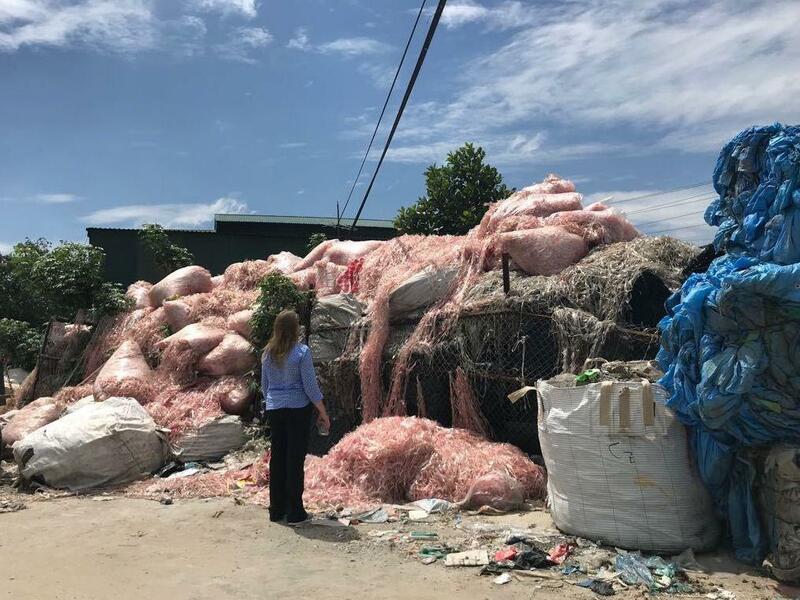 At this recycling center in southeast Asia, much of the waste is thin-film plastic that was once used to package single-use beverage containers. No one really knew until 2015. That's when Jenna Jambeck, an environmental engineer at the University of Georgia, did the math. Her groundbreaking study suggested there were hundreds, and perhaps thousands, of times as much plastic washing into the sea as people were seeing in those ocean gyres. Jambeck's findings helped galvanize a worldwide movement to stop plastic pollution. When I first meet the scientist for an interview, the first thing she says is: "So what we're going to do for the next 24 hours is to record everything that you touch that is plastic." My microphone has a plastic grip. "So let's write it down," she says with a smile and an air of efficiency. We go through my recording kit: plastic ID card, the zipper on the bag, a plastic data card and the plastic audio recorder .... I can tell this is going to be a long day. Jambeck started her career as an engineer specializing in solid waste management. She has become a connoisseur of trash, and what I carelessly call "the dump." "Landfill!" she says, correcting me. Her interest in trash started when she was growing up in rural Minnesota, Jambeck says. There was no garbage collection in her area, so she'd borrow a truck to take her family's trash to the dump every week. "I was always pretty fascinated by going there and just seeing what I would see," she remembers. "I fell in love with studying waste." We drive out to her favorite landfill, just outside Athens, Ga., and Jambeck makes it clear that we're not just going to view the garbage pile from afar. We're going to climb up onto it. "It's such a beautiful day out here," she says. That's true. The sky is brilliantly blue. There are also vultures hovering overhead, and the aroma is — challenging. The ground is mushy, but that doesn't slow Jambeck; she came prepared, wearing green rubber boots. "All right, I want to go farther," she says. She wants me to get a better idea of what plastic does in a landfill. Or, rather, what it doesn't do. "Plastic," she says with a sigh. "Plastic would be the thing that doesn't break down." It's the intruder. I look a little closer and see that almost all the junk on the surface of this pile is made of plastic. "A container of toothpaste," Jambeck points out. "That looks like the top of a detergent bottle." There's PVC pipe. Water bottles. A chip bag. When people discovered big floating patches of waste plastic in oceans, they wanted to clean it up. Jambeck agrees that the famous giant garbage patch in the Pacific is a nightmare. But upon seeing it, her thought was: Wait a minute. Let's find out where it's coming from. If you leave the tap on and bathwater floods your home, bailing water isn't the first thing you do, she points out. You shut off the faucet. "What we can do is keep plastic from going in the ocean in the first place," she says. Many countries, including the U.S., contribute plastic pollution, and it all adds up. 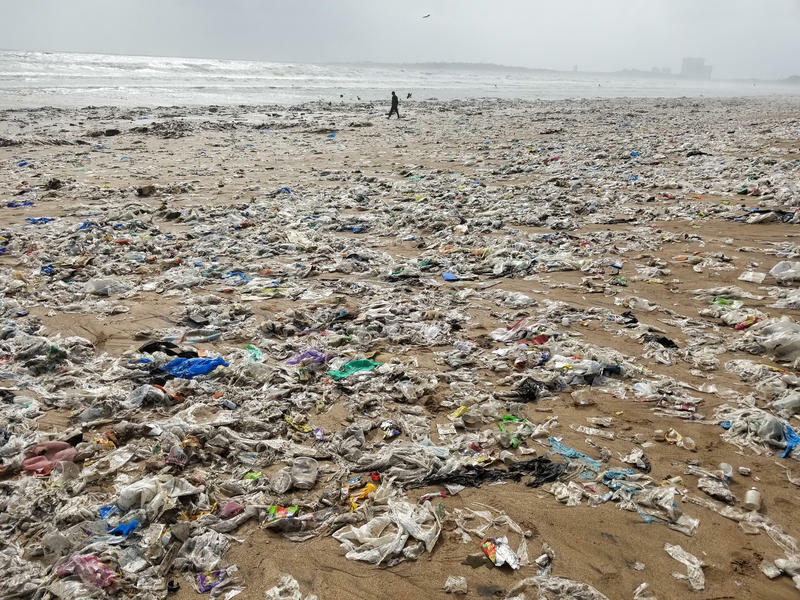 For example, in 2010 alone (the year's worth of data that Jambeck's Science study was based on), a total of 8 million metric tons of plastic entered the world's oceans. Holding up a bag full of plastic trash, she explained to the senators that 8 million metric tons of plastic is equal to "a volume of five grocery-sized bags filled with plastic for every foot of coastline in the world." She predicts the "8 million" could be 10 times as large by 2025, if current trends continue. Half of the waste comes from China, the Philippines, Indonesia and Vietnam. (Note: Though Vietnam puts nearly as much plastic into the ocean per person as China does, the Chinese population is so much greater than Vietnam's that China's overall contribution to total plastic in the ocean is much larger). All these countries have growing consumer economies and haven't yet developed widespread and efficient methods of waste management. And they have lots of ocean-facing shoreline. For Jambeck, the plastic litter in all our lives is a sign of society's failure. It's our era's footprint, she says. "Is that really the story we want to tell future generations?" In 2017, the U.S. State Department sent the "plastics ambassador" to advise other governments on how to manage plastic waste. She's also an adviser to the Ocean Conservancy, an environmental group working to stem the problem. Jambeck helped develop an app called Marine Debris Tracker for smartphones so that anyone can report on where they find plastic debris, anywhere in the world. Her students at the University of Georgia use it to track plastic waste on campus. "Now around the world people are reacting to that and trying to figure out what to do," she says. 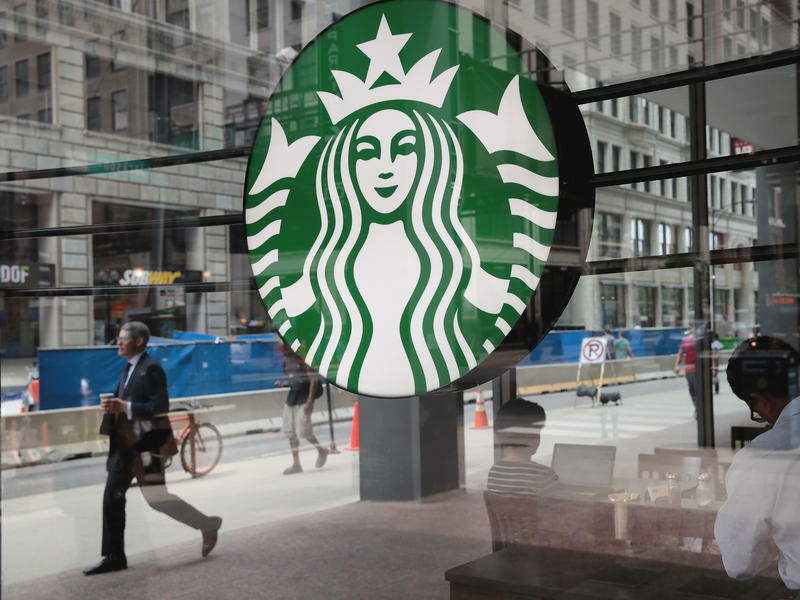 In many places around the world, consumers and government leaders are starting to pay more attention to what they use and throw away, and what they can recycle, Jambeck says. She's collaborating with a team of scientists looking for a model for plastic waste management that communities can adopt. "It was a piece of bologna," she says with a laugh. How did she know? "Because it looked exactly like a piece of bologna from a package." And why did that surprise her? "Well, it still looked like a piece of bologna you could eat," she says with amazement. "It hadn't broken down." A romantic "bonding moment," as Jambeck tells it, for this pair of professional garbage explorers. But she's a bit more hesitant to eat lunchmeat. "So they're going to dump, and then the bulldozer is going to come and move it and then the compactor gets his turn to drive over it" — to compress it, to maximize how much waste can be stored here. Our day isn't over. My plastic count is due. Back at Jambeck's office, we share the list. I touched 52 plastic items, all told: a credit card, restaurant menu, soap dispenser, my glasses, a ketchup container, an elevator button, a hotel chair — the list goes on and on. In five minutes, she puts together graphs and a pie chart that show what kinds of plastic all these objects are made of — whether they can be recycled, and what sorts of plastic in the overall "taxonomy" of global plastic waste I've come in contact with that day. "One of my goals," Jambeck says, "is to get people more in touch with, and to be thoughtful [about], the waste they generate." Plastic is both a wonder of modern technology and also one of the major environmental problems of our time. Plastic garbage is turning up everywhere. There are these massive floating garbage patches in the oceans. There are tiny pieces of plastic that end up in the food chain, including in our food. 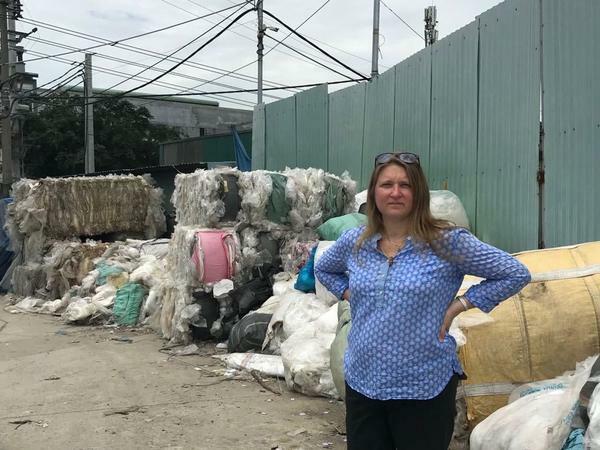 NPR's Christopher Joyce has the story of a woman who's telling the world how much plastic waste is out there and where it's coming from. CHRISTOPHER JOYCE, BYLINE: I met Jenna Jambeck at her office at the University of Georgia for an interview. I was not expecting homework. JENNA JAMBECK: So we were going to do for the next 24 hours is to record everything that you touch that is plastic. JOYCE: I'm touching something right now. JAMBECK: So let's write it down. JOYCE: My microphone holder - it's plastic. JOYCE: You mean the tape recorder? JAMBECK: Yeah, the tape recorder. JOYCE: A plastic ID card; the zipper on my bag. JAMBECK: All right. One, two, three, four, five, six, seven, and that was maybe three minutes. JOYCE: This is going to be a long day (laughter). JOYCE: Jenna Jambeck started her career as an environmental engineer specializing in waste management. She's a connoisseur of garbage dumps. She's taken me to one of her favorites near Athens, a couple of hours' drive from Atlanta. JOYCE: Excuse me - at the landfill. Jambeck grew up in rural Minnesota. There was no garbage collection. She had to borrow a truck to take her family's trash to a dump every week. JAMBECK: I was always pretty fascinated by going there and just seeing what I would see. JOYCE: And that fascination with the stuff people throw away grew into a profession. JAMBECK: I fell in love with studying waste. JOYCE: So there's no getting out of the fact that I'm going to have to climb up onto this landfill. Jambeck's going to show me what plastic does in the landfill, or rather, what it doesn't do. JAMBECK: Such a beautiful day out here. JOYCE: Yeah, you could say so. The sun's shining. The vultures are flying overhead. JAMBECK: It's gorgeous. All right. I want to go further. She's wisely chosen to wear green rubber boots. I'm just going to step where you step. JOYCE: What I see is a mound of dirt and muck about 50 feet high at the top, covering several acres. Trucks are dumping their loads. Miscellaneous bits of trash poke up out of the ground. JAMBECK: I see, like, a living, breathing thing. This whole system is actually an ecosystem. JAMBECK: Plastic would be the thing that doesn't break down. JOYCE: The stuff that's sitting out here is all plastic. JOYCE: PVC pipe, that looks like. Most plastic will break down into smaller pieces, eventually, but no one knows how long those pieces linger in the environment. And a lot of it ends up in the ocean. It collects in giant floating patches. People want to clean it up, and Jambeck says, sure, but wait a minute; let's find out where it's coming from. JAMBECK: We sort of backed up and said, well, how much do we think is actually going in? And what we can do is to keep the waste out of the ocean in the first place. JOYCE: No one really knew how much plastic was washing into oceans or just where it was coming from, but in a seminal paper published three years ago in the journal Science, Jambeck figured it out. It made a big splash. The Senate Environment and Public Works Committee invited her to testify and to tell them just how bad the problem was. UNIDENTIFIED PERSON: Dr. Jambeck, you're next. JOYCE: It was Jambeck's first appearance in Congress, but she came with hard information no one else had, and it was pretty shocking. JOYCE: She held up a bag full of plastic trash. JAMBECK: ...Grocery-size bags filled with plastic for every foot of coastline in the world. JOYCE: That's right - five bags for every foot of coastline in the world. Jambeck says half of that waste comes from China, the Philippines, Indonesia and Vietnam, countries with growing consumer economies but little waste management. Most of what shows up on beaches and in the ocean is single-use plastic - grocery bags, bottles and caps, straws, utensils, packaging, mostly manufactured in the West. By Jambeck's calculations, in 2025, 10 times as much plastic could be going into the oceans. JAMBECK: It seems to be that that's going to be our footprint in this time period. Is that really the story we want to tell future generations? JOYCE: Jambeck is trying to change that story. She's been appointed by the U.S. State Department to be sort of a plastic ambassador who advises foreign governments on how to manage their plastic waste. She advises the Ocean Conservancy, an environmental group working to stem plastic waste. She says putting actual numbers on how much plastic waste there is has made a difference. JAMBECK: Now around the world, people are reacting to that and trying to figure out what to do to have a positive impact. JOYCE: Like looking for plastic substitutes for utensils or packaging and getting people to pay more attention to what they use and throw away and what they can recycle - and getting plastic out of landfills like this one. Jambeck met the man who would become her husband on top of a landfill. They were both doing research, digging into the very bottom of a landfill to see how things decompose. They pulled up an immaculate piece of lunchmeat. JAMBECK: It was a piece of bologna. JOYCE: How do you know it was bologna? JAMBECK: 'Cause it looked exactly like a piece of bologna from a package. JOYCE: It was a bonding moment. JAMBECK: We laughed at the bologna (laughter). JOYCE: It's a hot afternoon, and the aroma is rising - volatile fatty acids, Jambeck explains. But then a truck arrives with a fresh load for a waiting bulldozer and compactor. JAMBECK: So they're going to dump, and then the bulldozer is going to come and move it. And then the compactor gets his turn to drive over it. JOYCE: OK. I don't need to wait to see all that. JAMBECK: (Laughter) Oh, you just broke my heart. 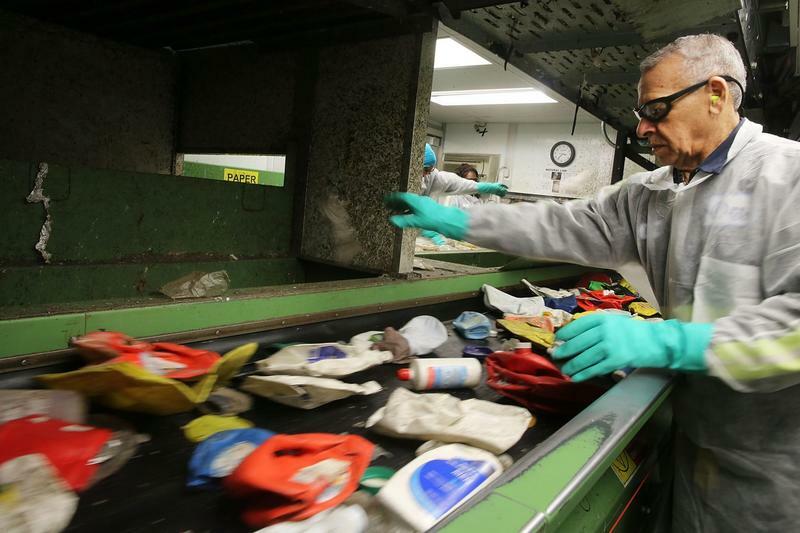 How Can We Make Plastic That's Easier To Recycle? The University of Georgia recently released a study showing that an estimated 111 million metric tons of plastic garbage will pile up around the world by 2030. Plastic waste that could be recycled ends up in the oceans and in landfills, and there are plastics that can’t be recycled at all.